This weekend went by so fast. It’s hard to believe that I will be heading back to work tomorrow morning, but partly that is because I had to work today for a while. I was really craving one of my pre-Celiac pizza treats, Papa John’s Cheesy Sticks. Maybe it’s all those commercials while I’m watching football. When I got home from work at 3, I decided to try and recreate them, gluten free, from scratch. But first, I wanted to recap the busy day I had. I got up relatively early for a Sunday, around 8:30, so that I could take some time and enjoy my coffee before I had to be at work at 10am. I opted for a smoothie for breakfast. It had been a while since I had busted out the Ninja blender. I mixed a peach Chobani 100, which 1/4 cup blueberries, half a frozen small banana, and some ice. It’s quick, healthy, and easy for on the go. Nick and I took Peanut on a quick walk before I headed off to work. It was pretty humid outside, but only got up to 85 today. I was definitely enjoying my walk across campus. When I got home, Nick was in full football mode. He had made some appetizers in the oven, jalapeno poppers. Omg, these are so delicious. Cream cheese stuffed jalapenos, wrapped in bacon? Umm, yes please. For the cheesy bread, I use a pizza crust mix from GF Jules. It helps cut out a few steps, but it’s actually pretty easy to do from scratch as well. The mix comes with the yeast packet, so you just need some pantry staples on hand to throw this together. Using the dough hook on my Kitchenaid, I mixed two egg whites, 1/2 teaspoon apple cider vinegar, two tablespoons extra virgin olive oil, and 1/4 cup really warm water. Then I slowly add in the flour mixture, with another 1/4 cup warm water. I usually add in some extra garlic powder. Once mixed, add in the yeast and mix on high for 2 minutes. No need to proof it. 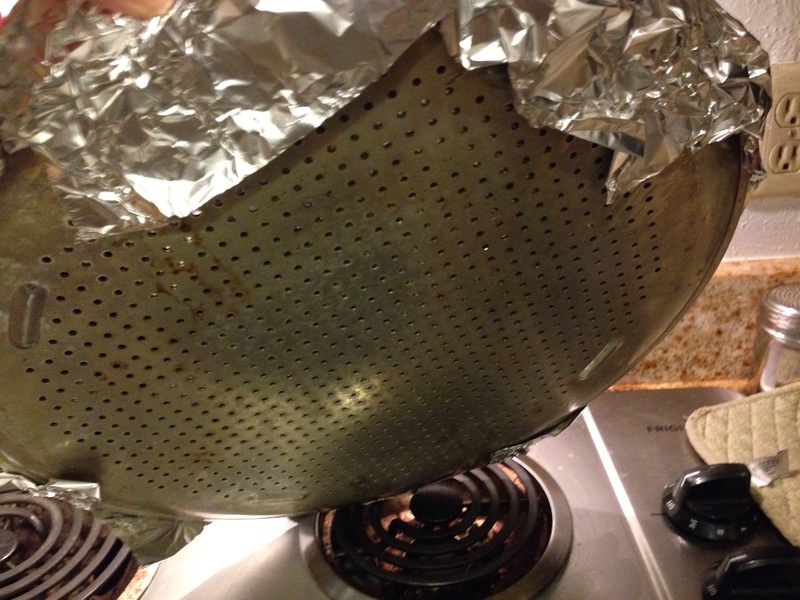 I wrap the top of my pizza baking dish with foil, and spray the top with cooking spray. The little holes on the bottom help it evenly cook. To help spread the mix out, I usually put some olive oil on my hands before spreading out the dough. This seems to work best. Now it’s time to let the crust rise. Based on GF Jules suggestion, I usually let it rise in a 200 degree oven that has been turned off. Cover the top of the dough with parchment when you do this. Once it has risen, poke some holes in the dough so that you don’t get air bubbles. Bake in a 375 degree oven for 15 minutes. Now add whatever toppings you want. For my cheesy bread idea, I used a mixture of minced garlic (that had been sauteed in a little bit of butter. I covered the top with mozzarella and Parmesan. Once the toppings were on, I then let it back for about 15 more minutes. I served them with some tomato sauce for dipping. Definitely not the healthiest dinner, with the poppers I had earlier, but a delicious end to the weekend! Now, back to the Cowboys game, which is going really really awful so far.